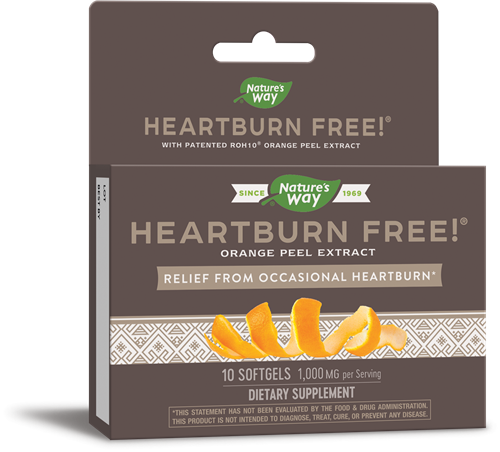 Heartburn Free® w/ ROH10® / 10 softgels - Nature's Way®. Why use Heartburn Free® with ROH10®? dult (18 and older) Upon first experiencing symptoms, take one softgel every other day for 20 days, and one softgel as needed for occasional relief thereafter. Best if taken one-half hour before or one hour after meals, with water or your favorite beverage. Swallow whole. Do not bite or open softgel. Can I take Heartburn Free®* with ROH10® every day instead of every-other-day as recommended? While Heartburn Free®* with ROH10® was formulated to be taken every-other-day, it can be safely taken daily as well. Can the Heartburn Free®* with ROH10® capsule be opened and mixed with food or juice? No, Heartburn Free®* with ROH10® must be swallowed whole. We do not recommend opening the capsules and mixing the contents with food or liquids as the volatile oil in this product could irritate the throat. Can children take Heartburn Free®* with ROH10®? No, we do not recommend this product for children. Although it is not necessarily unsafe, there have been no clinical trials of this product in children. Additionally, the capsule is very large and would be difficult for a child to swallow. Can I take Heartburn Free®* with ROH10® if I am allergic to oranges? Heartburn Free®* with ROH10® contains an all-natural key ingredient, D-limonene, which is the main component in the citrus peel oil of oranges. It is isolated from the citrus peel oil by a purification process. Despite this purification, Heartburn Free may contain minute amounts of substances problematic to allergic individuals. Thus, citrus allergies could possibly be aggravated by exposure to this product. We cannot completely predict individual responses to any dietary supplement, as reactions may vary based on unique health and nutrition needs. Therefore, we encourage consumers to discuss all substances they are considering for use with their allergy specialist if they suspect a product may cause an allergic reaction.